In the courtyard of a Berlin tenement block, the vestiges of an early 19th-century mural of an Alpine landscape featuring a bridge, lake, mountain hut and snow-capped peaks covers the back wall. The mural, painted in around 1904, has become sun-bleached and rain-washed over the years. Its paint has cracked and peeled, and the plaster has crumbled away, exposing large patches of the brickwork beneath. 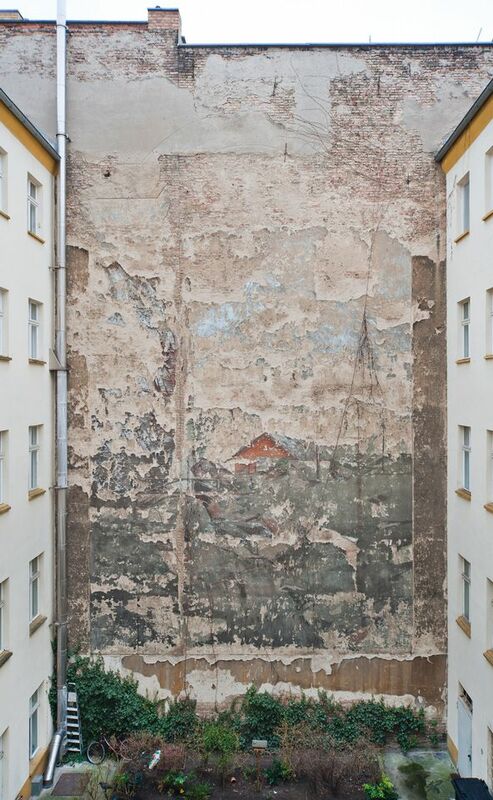 The mural, in Erich Weinert Strasse in the Prenzlauer Berg district, is one of many created for the housing complexes built in the late nineteenth and early twentieth century to accommodate an influx of people to the booming German capital. The paintings offered residents a virtual respite from the grime, squalor and hectic pace of the metropolis. The ten surviving murals have caught the attention of the Berlin Heritage Authority, which is examining the feasibility of their restoration. Without action, there is a danger they will disappear in the coming years, says York Rieffel, the chief conservation officer at the authority who is working with Konstanze von zur Mühlen, a heritage consultant and the founder of the private firm AM Restore, on the project. Mühlen says the restoration will be “low-key,” aimed at increasing the mural’s “readability” rather than trying to return it to an original state that is not documented. The plaster and cracks will be filled and sealed using needling techniques. A particular challenge is finding a sealer for the plaster that will not damage the mural, which was painted using a fresco-secco technique with pigments and oil. Climbing plants will be removed and a roof put over the painting to shelter it. “It’s a big experiment,” says Rieffel. As late as 1995, at least 25 murals remained, as documented by Werner Brunner in his 1996 book Verblichene Idyllen (Faded Idylls). But many have been lost in the building boom that followed the fall of the Berlin Wall. The names of the artists of the ten remaining murals, which show landscapes, architectural features and scenes from the opera or theatre, are lost to history. Rieffel speculates that theatre-set painters may have created them. Where the murals are listed as protected heritage, the homeowners have to help pay for their restoration. In one block on Fichtestrasse in Kreuzberg, work has already started on a mural showing a scene from Don Giovanni, Rieffel says. The owners of the flats contributed half of the €40,000 needed; the authority is funding the balance.